December 15th $15 Donation. Children free. An Extraordinary Anthology of International Bagpipe Music! Drone Magic is a unique festival with bagpipe music from around the world and with several pipers performing music and traditions of their own heritage. From dark laments to fiery dance music, listen to the piping traditions of Spain, Bulgaria, Scotland, Greece, Sweden, and Hungary. As always, the Gala Concert will feature a variety of piping traditions found around the Winter Solstice. Enjoy Swedish, Hungarian and Croatian traditional Christmas pipe music as well as New Year celebrations from Scotland and the Hungarian Csángó people of Moldavia - don't forget to bring your bells, horns, rattles, and other noisemakers to join the merry-making! The afternoon activities include mini concerts from 4 - 6 pm, and exhibitions of paintings, photographs, bagpipes and videos. Mark Walstrom will open the Festival with a presentation of his bagpipe collections; Ferenc Tobak and his Family Band will perform Hungarian music on bagpipe and other instruments. Our feature presentation of the afternoon will be the Women Pipers Concert. This year's Festival includes the California debut of talented Hungarian painter, Mihály Jakab. Jakab brings folk motifs into his contemporary oil paintings of traditional musicians in much the same way Béla Bartók used folk melodies to compose modern music. 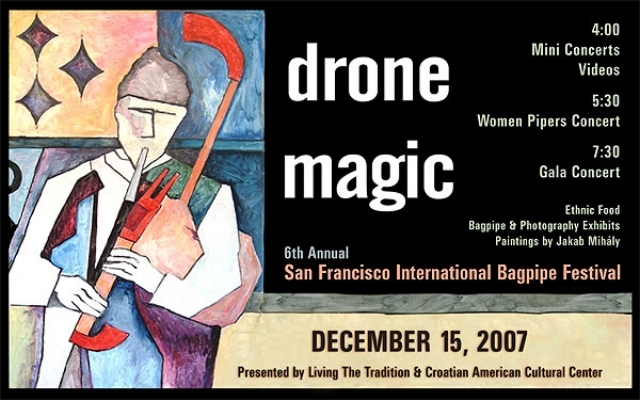 This year's Drone Magic graphic (above) features a detail of one of Jakab's paintings. - Photographs by Ferenc Tobak taken in Eastern Europe of Hungarian, Romanian and Gypsy village musicians. - Bagpipe exhibit showing a variety of instruments from around Europe: from Italy to Estonia and from Ireland to Romania. - Videos will be shown throughout the afternoon and will include "Bulgarian Pipers" by Bruce Cochran, films from Mark Walstrom's collection, and samples from Ferenc Tobak's latest research trip. For information about ongoing cultural programs sponsored by the Croatian American Cultural Center, call 510/649-0941. For door-to-door directions and a detailed map to any of our event locations, we recommend using Yahoo maps.